Google's front page informs me that today marks the 110th birthday of Belgian Surrealist artist Rene Magritte. Magritte is one of my favorite artists. My partner and I dressed up as Magritte's "Son of Man" for Halloween - wearing suits, bowler hats, and apple masks. I may post pictures of that later. 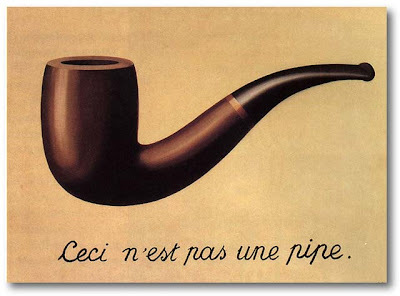 First of all, here's "Son of Man:"
Next, here's what is probably his most famous painting, called "The Treachery of Images:"
The caption, "This is not a pipe," is actually quite true. Magritte's point, of course, is that this is merely a picture of a pipe, an image. You can't smoke it. He followed this up with several other "this is not a" paintings in the same vein. The piece depicts a scene of identical men dressed in dark overcoats and bowler hats, who seem to be floating like helium balloons (though there is no actual indication of motion), against a backdrop of buildings and blue sky. It is humorous, but with an obvious criticism of the conventional effacing of individuality. Magritte himself lived in a similar suburban environment, and dressed in a similar fashion. The bowler hat was a common feature of much of his work, and appears in paintings like The Son of Man. 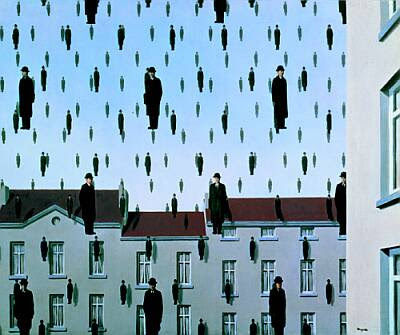 For more Magritte, here's a Google Image search.